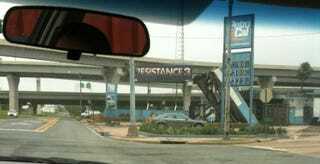 Prop Billboard Gives Up Resistance 3 Date? Here's a billboard spied by a NeoGAF user down in Shreveport, La.. Note the details of the frame - bombed-out gas station, prices are 80 cents higher than the area's average. This is a movie set. The NeoGAF user (goldsoundz) who spotted this says it's in an area of Shreveport commonly used for filming movies. Other GAFfers pieced together that it's probably for an upcoming movie called Battle: Los Angeles, which is produced by - ding ding ding - Sony's Columbia Pictures. The picture's release date is February 2011. The full uncropped pics taken by goldzoundz are over on NeoGAF. Note also the Resistance 3 logo - and the Statue of Liberty forming the vertex of the A. I guess the Chimera are going to lay waste to New York. I've emailed a press contact for Insomniac Games to ask if they have any comment. Should any be given, I'll put it here.